A British peace activist shot in the head while observing the Israeli army in Gaza last year has died in hospital. 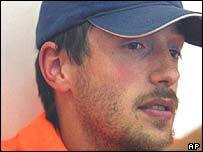 Tom Hurndall, 22, of north London, had been in a coma since being shot in a Palestinian refugee camp. An Israeli soldier has already been indicted on six charges, including one of aggravated assault. Mr Hurndall was with the International Solidarity Movement, a Palestinian-led group which campaigns against Israeli occupation using non-violence. Mr Hurndall's family now want a murder charge to be brought. The soldier initially said he had returned fire at a man armed with a pistol - but under interrogation admitted firing a shot near an unarmed civilian, according to the Israeli army. Mr Hurndall was overcome by pneumonia at the Royal Hospital for Neurodisability, in south-west London. The Israeli Embassy in London said charges had been brought against the soldier after a "full and independent investigation". It said in a statement it was "deeply sorry" to learn of the death of Mr Hurndall, a former photography student at Manchester Metropolitan University. The statement said: "The Israeli Government views this tragic event with the utmost severity, and is acting to ensure that justice is served. The Israeli Government is fully co-operating with the British Government on this matter." But Mr Hurndall's family, from Tufnell Park, north London, have said any Israeli army investigation would be a whitewash. "We're hugely relieved that we've got this far, that the soldier has been charged," Mr Hurndall's sister, Sophie Hurndall, told BBC Radio 4's Today programme. But she warned: "We've yet to see what his sentence is going to be. "The army has been the whole way along with this trying to get itself off the hook, and its soldiers. "What happens in the occupied territories is covered up at any costs." However, Ms Hurndall said, it now appeared to her that the army was cutting its losses and "hanging this soldier out to dry". Relief that her brother's ordeal was now over was mixed with great sadness, she said. Ms Hurndall said her brother had been pulling two children to safety when he was shot. British cameraman James Miller was shot dead in the same area on 2 May, also by Israeli soldiers. In March, an Israeli bulldozer crushed US activist Rachel Corrie to death in Rafah as she tried to protest against the demolition of a house. "A life ended prematurely, but a campaign gaining momentum"